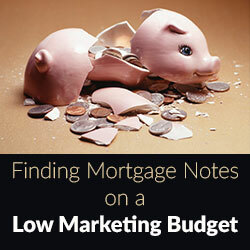 Many mortgage note brokers who are just starting out have a low budget or no budget at all. If you are a note broker without a sufficient budget for advertising your note buying business, then you know marketing your business and finding profitable notes can be difficult. However, while it may be challenging, there are many ways you can improve your success at locating notes and getting note sellers to accept your offers. Having worked in the mortgage note buying industry for over a decade, there was once a time when I faced the same problem. If you don’t have a high budget to invest in advertising your note buying firm, then you have to make up for that in time and effort. Once you start closing deals, you can generate a better budget and get your name out there. There are a number of ways you can locate note owners who are looking to sell their mortgage notes. The hard part is channeling profitable leads to your note buying business when you have a small or no marketing budget. Here are some ways that you can reach note holders and get them to accept your offers. While these methods won’t produce instant success over night, they can help you close deals and have a better advertising budget to work with. Real Estate Advertisements – A great way to generate leads is to look through real estate advertisements to find sale-by-owner properties. Browse through classified ads, real estate publications and sale-by-owner ads and reach out to their contacts to discuss your note brokerage business and services. Explain how you can help the property seller create a mortgage note that will deliver an ample return on his/her investment. While not every note holder you call will be interested, you are likely to close one or two deals for every 50 calls you make, which could translate into thousands of dollars per closed deal! Local Business Events – Find and attend business events and conventions, such as real estate conventions, mortgage broker conventions and law and finance events that specialize in real estate, in your area. At these events you can reach out to professionals who have clients who produce mortgage notes they might wish to sell for top dollar. Brochures and Letters – Create letters and brochures discussing your business and note buying services and send them to lawyers, real estate agents and mortgage brokers. A lot of these professionals have clients who are looking to sell a mortgage note or to seller-finance their home and create a mortgage note that will sell for top dollar. Courthouse Leads – Courthouse leads are another effective way to find mortgage notes. Head to your county courthouse and create a list of mortgage note holders who created a sell-financed note in the past 6 months to 3 years. Write the note holders a letter explaining your note buying services and how you can help them achieve an ample return on their investment. Loan Serving Companies – Connect with loan serving companies to see if they will let you add your marketing materials to their customer’s monthly statements for the seller-financed notes the company is servicing. The note holder is already using that loan serving company, which will make your business come off as an endorsement. Again, while these methods will not generate success overnight, they will help you produce more leads and convert them to profitable sales. From there, you can achieve a higher marketing budget and expand your advertising strategies. Abby Shemesh is the founder and managing partner of Amerinote Xchange, LLC, a principal note buying firm that purchases mortgage notes, real estate contracts, and business notes nationwide. 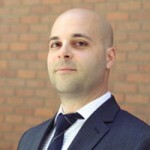 Mr. Shemesh has been operating within the mortgage market for nearly a decade. His background originally lies in commercial and residential mortgage loan originations. He made the full transition into the secondary market and loan acquisitions realm in early 2006. As an experienced debt-investor, Mr. Shemesh has been the expert contributor on the world of private business-loan trading for Cash Flow Exclusive's e-magazine and website since 2010 and The Paper Source newsletter since 2014. For more information, please visit www.AmerinoteXchange.com.